The chaplain, Revered Castells, who visited the patients on board the smallpox ships would have been a brave man as smallpox was highly contagious. He would have regularly vaccinated, along with the other staff, to prevent him from catching the disease. He would have ministered to both the patients and staff. The Chaplain’s Report Book for 1902-1914 reveals the number of visits the chaplain made, the services he gave and his other duties including choice practice. When Long Reach hospital opened his duties were extended to cover staff and patients there. The Cemetery at Joyce Green was opened in 1902 and a Chapel of Rest built. The chaplain had a busy time during epidemics when up to 10 bodies were buried in each grave. The Incumbent at St Albans Church was the Chaplain for Long Reach, Orchard and Joyce Green during the First World War. When the Orchard became the Australian Auxiliary Hospital the chaplain arranged for them to have books and ran the library as part of his duties. The Australians courted and married many local girls at St Albans church. The chapel at Joyce Green gave its name to Chapel Street, where it was situated until it was knocked down to make way for new theatres, the chapel was then moved to a disused ward. The hospitals at the Southern and Darenth has purpose build chapel. The church at Darenth was originally built for the Schools for Imbecile Children; a chaplain was employed as the spiritual needs of the children were very important. Like all of the chapels male and females were kept separate, either at different services or with male and female ‘sides’. Darenth also had it own cemetery, many smallpox burial are in the oldest cemetery transported here before the cemetery at Joyce Green was built. 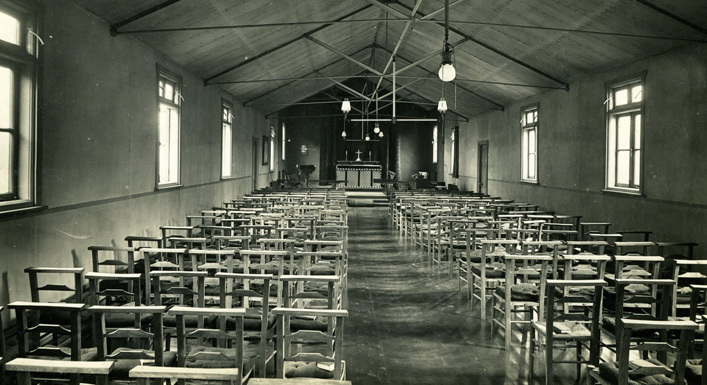 Mabledon hospital was home to many displaced Poles from the Second World War, They had their own chapel and their spiritual needs were ministered by St Margarets Church, Darenth. Many Poles are buried here. The spiritual needs of Dartford’s Workhouse were ministered by the Holy Trinity Church, Dartford, hence the magnificent gift of two Kempe Windows.